Chris jerks 225 at the 2010 Games. While he is best known for his superb conditioning and bodyweight strength, Chris Spealler is also an elite weightlifter. Speal will be competing in the 62 kilogram weight class at the CrossFit/USAW Open. With a solid performance, Chris could qualify for the USAW Nationals. This video takes a look into Speal's preparation for the event. He explains how his training has changed in preparation for the meet. 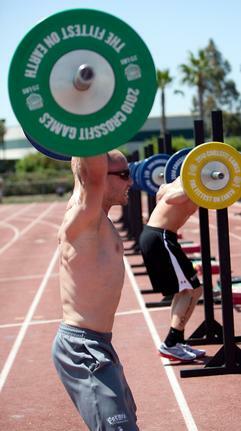 He's training the split jerk from the rack position. Speal is feeling good and ready to beat his previous record (255 pounds - close to double his bodyweight) today. Note: Speal incorrectly states his weight class as 63 kilograms in this video. It will actually be the 62 kilogram class. His Class will be the first to lift on Friday. Kick off the live feed action watching the 3rd fittest man on the planet seek a berth in the USAW Nationals. 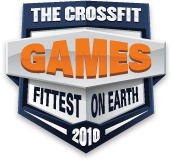 Chris put 225 pounds overhead in Event 2b of the 2010 CrossFit Games. That was just 90 seconds after taking second overall in the Pyramid Double Helen. It's scary to think what he can do with a resting heart rate. Why even worry about the triplet? There is only one other guy in his weight class. Poor guy probably gonna get smoked. 24 September 2010 / 7:13 a.m.